All companies are tech companies today. That sentiment was reinforced as industry leaders gathered in New York City to discuss the cloud, mobility, and the Big Apple's influence on the sector at this Airfoil-hosted roundtable. Gideon Fidelzeid (PRWeek): Define what technology is in 2014. David Bailey (Airfoil): I used Uber to get here today. Companies must focus on how technology can either help them accelerate or how it will kill them. Think about the taxi companies that are probably cursing Uber. Everybody needs a tech strategy. Jessica Lawrence (NY Tech Meetup): The dictionary definition is the application of knowledge to solve a problem. I would add a clause about humans figuring out tools to help them adapt to their environment. Our recent study found the number of tech jobs in non-tech companies exceeds those employed in tech jobs at tech companies in New York City. That underscores the expanding definition of tech. Josh Rosenberg (Day One Agency): A co-panelist is wearing the Fitbit. I have the Jawbone Up. With that sort of technology, people have the power to change. It’s also an opportunity for companies to rethink communications. Lisa LaCour (Outbrain): It is the underlying basis of everything we do. The word "technology" is not necessarily in average consumers’ vernacular. It’s more about what makes their daily lives easier. Dan Barnhardt (Infor): The wheel was technology at one point. It solved a problem, but problems change. Today, people look to collaborate and share, which impacts communications. Melissa Waggener Zorkin (Waggener Edstrom): Lines are blurring between all industries as the result of technology, which impacts who can enter all these sectors. To take a different twist, I’m excited about technology that enables the solving of world problems. Josh Kampel (Techonomy): People interchangeably use "technology" and "innovation," but there is tech-driven innovation and there’s innovation that comes from improved processes. Technology is an enabler. It’s also interesting people refer to Google as a tech company, but it’s getting into drones, photo satellites, even Google X or Ventures. It’s becoming this ubiquitous company, no longer just tech. Conversely you have brands such as MasterCard and Ford that say, "We’re a tech company." Victoria Taylor (Reddit): Technology is any tool that enables things to accelerate, whether it was the wheel or an instant solution that connects people with service providers. It is all about making things even more seamless so they happen at a quicker rate. Gary Stockman (CSC): I recently joined Computer Sciences Corporation and found it amazing the word "computer" was in the name of a company founded in 1959. However, CSC’s orientation has always been solving difficult problems through technology. That has become the classic definition. In the past 20 years or so, the major pivot is we now talk about technology in terms of the benefit it delivers. Previously, the focus was capabilities, speeds, and feeds. It’s also fascinating to see the level of change that is consumer-driven now. Even technology in the workplace has morphed on the basis of consumer preference, not what the CIO says. Blair Decembrele (LinkedIn): Years ago, consumers conceptualized technology as being something far off. Now it’s in their hands, be it Fitbit or just signing up for a spin class online. LaCour (Outbrain): That’s where data empowers companies to see consumer patterns and apply those to what they do. Barnhardt (Infor): The iron and vacuum cleaner were first at work, and we wanted those at home. Now, consumer tech has outpaced business technology in many ways. We want the stuff we use at home at work. Kampel (Techonomy): The CIO and CTO have transitioned from just being the purchasers of technology to being key parts of business-moving decisions. The CEO set the direction and the CIO or CTO bought the technology to empower that vision. Now, they are part of that discussion. Technology is embedded in the essence of what it is to be a person. It might have been more unexpected to talk about technology being essential and intrinsic to being human 20 or 30 years ago, but today it’s routine. Leaders of these companies need to more self-consciously recognize they are technologists. It’s interesting that many of the brands doing the best at [this] are the oldest and biggest companies in the world, such as P&G, GE, Unilever, a lot of the oil companies. Their longevity has been helped because they view themselves as adaptive tech-centric organizations that will embrace the new. I don’t even like talking about industries anymore. The many startups and entrepreneurial organizations emerging across the planet are proving that if you wed yourself too closely to the idea of being in the airline, waste management, mail delivery or whatever business, you will get blindsided by somebody with a larger concept of what is possible. The way we think about business journalism is fundamentally wrong on balance because the presumption we bring to business journalism is that it’s about money, markets, and the returns to investors. However, if you’re thinking about how business media or communicators can be more effective at a macro level, focus more on the consequences of the business’ behavior. If you focus on one thing Facebook has done, it has given people communications power they never had before. It was true when it launched. It’s true today. Facebook is about empowerment. And while so many other systems have emerged with similar impact, Facebook was and remains a driving force of it all. It changed the world – and it still is. Click here for more from Kirkpatrick on privacy and the best ways for communicators to work with Techonomy. Gideon Fidelzeid (PRWeek): What has been the biggest impact of cloud-based computing? Lawrence (NY Tech Meetup): Having things in the cloud has totally changed the workforce dynamic. It enables a more dispersed staff and the hiring of talent that previously might not have committed to you. It’s also blurring the lines of the economy. There may be a graphic designer in Brooklyn hired by someone in Iowa. The Iowan is impacting New York’s economy. Waggener Zorkin (WE): The human element, the analytical element, the relationship piece is what’s so important about big data and cloud computing. We can have reams of data, but humans explain what it all means. The cloud helps that process. Stockman (CSC): It has facilitated an environment where we increasingly look to hire people who can think analytically. We need creative people who are able to apply that creativity based on insights gained through analytics delivered via mobile and the cloud. Kampel (Techonomy): Clinical trials used to be done by collecting data at a site and someone manually entering the data before it gets to the actual processing. You would see big issues with drugs causing problems worldwide where they couldn’t see the trends. With the cloud, it all happens in real time. You can spot differences and problems before they become major issues. The cloud enables efficiencies in all industries. Bailey (Airfoil): Look at Tesla and the issues it had with car fires. It did an over-the-air update to change the car’s suspension. Talk about the cloud’s impact. It spurred a genuine discussion about whether Tesla is a tech company, an auto company, or both. Barnhardt (Infor): The cloud enables companies to be more specific than ever in staffing based on behavioral traits or cultural fit. You can come up with a profile of your top performers and screen employees based on responses to relevant questions and how their personalities fit with what you’re doing. Taylor (Reddit): We see people posting content hosted within the cloud to Reddit. They’re conversing around what may be a similar topic, but each piece of content is hosted on a different cloud platform. The fact people can connect around these different pieces of content hosted in such multifaceted places contributes to a richer, deeper conversation. Rosenberg (Day One): In terms of instantaneous and transparent connections, the cloud enables communicators to act almost the way Elon Musk did during the incident David brought up. Decembrele (LinkedIn): It’s the ability to break down barriers and be much more efficient. I can work with a colleague in the Ukraine or India in a manner that doesn’t prohibit cycle time. Lawrence (NY Tech Meetup): The cloud also helps with offline connections. When you get together in person, your relationship is already enhanced because you’ve been talking on Twitter or Facebook, or chatting. LaCour (Outbrain): All our technology is in Israel, where we have 140 people. The ability to communicate face to face over the cloud is vital when you consider cultural differences, personalities, and language barriers. Things get lost in translation in memos or emails. Fidelzeid (PRWeek): With consumer expectations of them very high on the mobile front, how can tech companies stand out? Rosenberg (Day One): It’s about optimizing the message based on the right time, place, and device. Tech companies, in particular, are able to do that. They can target a niche group with a message, down to the device where they receive it. Tech companies can truly leverage what they know best in the world of communications. And if you have an app or a way to send them a push notification that’s valuable and something they’ve opted into, you can make a sale very easily. Waggener Zorkin (WE): Simplicity is a great thing. Tech companies now realize you only have X amount of time to get in front of your audience with something relevant, distinct, compelling, and emotional. This is great for communicators, as simplicity translates to happier consumers who can give you feedback. Stockman (CSC): The idea of drones as capturers and potentially distributors of information and items is very intriguing. That will stretch the boundaries of what we consider mobile to be. Barnhardt (Infor): If you say "I have a mobile strategy" today, you’re behind. You should have talked about mobile strategy years ago. It’s about the experience now. Consumers want the same experience wherever they are on whatever device they’re using. LaCour (Outbrain): Is Uber really a car company? Think about what the underlying platform enables. It’s moving people from place to place. It’s getting tons of data about where people are going and how they’re using it. It’s building a powerful foundation. Moreover, I’ve heard anecdotally that a big part of Uber’s growth is in wealthy Muslim countries where women can’t drive. Ponder what that will do for our social economy. Taylor (Reddit): It’s about building a personal relationship. With the Line app, pictures represent emotional states. It has a palette of emoticons and emojis and you can buy endless packs of them to expand the experience. Building that emotional connection with mobile users is where many apps are taking off. Lawrence (NY Tech Meetup): Everyone is developing apps, but in looking at user behavior, you realize there are times people just want a mobile-enabled website to access on their browser. A perfect example: A government group was developing an app to teach teens about STDs. If you need to look up that information, first, you won’t want an app on your phone that says "STD." Second, you likely won’t download it. You just want a good website where you can look up the information quickly. Waggener Zorkin (WE): Mobility is changing behavior. It’s helping youths vote. It’s helping mothers get healthcare information where hospitals don’t exist. It’s not always just about an app. Sometimes it’s that bit of information crafted for a certain person or group so they can do something they never could before. Kampel (Techonomy): It’s about understanding your audience and how they consume information. Companies that aren’t traditional tech entities don’t think of it that way. Mobile is the buzz and they just want to get there quickly. Bailey (Airfoil): The concept of "mobile moments" encapsulates the whole right time, right place, and right method philosophy. Sometimes it can be a simple text message when I’m in an airport and can’t hear the announcement that the plane is late, but a text message informs me. That’s a mobile moment. Getting it right creates instant loyalty. Stockman (CSC): You know what will engender loyalty? Mobile applications you can read and decipher on the smartphone. As more information gets delivered to screens that size and the people using those devices get older, this becomes a bigger consideration. Decembrele (LinkedIn): Consumers have short attention spans. Communicators must think about the right moment to reach them, all while making their lives easier. It takes a diversified communications plan with marketing and social to make it more robust. Gideon Fidelzeid (PRWeek): The Supreme Court recently ruled police must obtain a warrant to search the data on a suspect’s cell phone. Widely deemed a major victory for citizens’ rights to privacy, what are your views on the decision and on privacy’s impact on communications? the idea this is not some random device in our pocket; it is inextricably linked with who we are. Waggener Zorkin (WE): It was definitely a victory for the individual, though I worry about various entities keeping up with the pace of change in every industry. Think about all the regulations and other countries that are doing things faster, bigger, and better for their consumers. The US sometimes lags. It’s crucial the people governing all this gain a better understanding of the prescience of technology, where it’s moving, and how they must move to that point more quickly. Kampel (Techonomy): I’d also note the European Union and the right to be forgotten. Now you’re talking about censorship and the ability to take information down. Is that a win for the individual? We created this worldwide Web, where information exists forever. Should the individual have the right to retract that? For them to say yes was amazing. And speaking of government, tech is accelerating everything so quickly and regulators can’t keep up. Supreme Court justice Antonin Scalia was asking questions about Aereo during the recent copyright case, and it was amazing how underinformed the people making big decisions are. He didn’t realize HBO was a subscription service, for example. Barnhardt (Infor): There’s another case that concerns me. A US judge ruled Microsoft must turn over a customer’s emails even though the information is held in a Dublin data center. The basis for this decision is that Microsoft does business in the US. That has huge implications for companies with global partners who work on the cloud. Will this force us to have a data center in every country? And if we do, will the fact we do business in the US allow government access to it? Lawrence (NY Tech Meetup): There is also the citizen-to-citizen relationship to consider. We are basically being tracked everywhere we go. People can capture us on camera. Is there even such a thing as privacy anymore when I can take pictures of all of you just by pulling a small device out of my pocket? Taylor (Reddit): A core tenet is our members don’t use their real names nor share their identity. The only exception is our AMAs because you must verify you are legitimately Arnold Schwarzenegger, Madonna, whoever. For everyday users, this frees them to express themselves in different ways and to build their own identities within the community. Within each subReddit are people who become experts on certain subjects. Their user name becomes a trusted source for data. Decembrele (LinkedIn): We’ve found the opposite. Having content tied to professional identity has created rich conversations. On average, we have 200 comments on every post, so engagement is very high. One way works for Reddit; another works for us. Gideon Fidelzeid (PRWeek): Why has New York become such a prime technology hub? Bailey (Airfoil): I’d ask why it didn’t happen sooner. New York is the center of finance and capital, as well as the media, not to mention the sheer communications infrastructure. Silicon Valley was the place to be. Now, you must be both places. How can you be in the tech sector and not have a notable New York presence? Decembrele (LinkedIn): It’s exciting to see companies such as Twitter, LinkedIn, Facebook, and Google expand so rapidly in New York, particularly when you look at the transformation of talent. You’re already seeing top people from other sectors enter tech. Bailey (Airfoil): Much has been written on the "Silicon Valley bubble" and people living in it too much. The Valley needs New York as the opposite of that. Stockman (CSC): New York is also a place young people want to live. You can’t underestimate that, particularly since the tech industry skews so young. Lawrence (NY Tech Meetup): In terms of technology, New York found itself in an unusual position – being the underdog. The businesses based here, as well as the city government and the Economic Development Corporation, invested a lot to showcase its growing technology community. Mayor Bloomberg was instrumental in getting tech companies to come here. Moreover, though it’s a big city, New York also has a sense of community. You can run into the same people over and over. It’s extremely competitive, but there is this sense "we’re all in this together." Many people have told me the interactions in New York are much more open than in Silicon Valley. Taylor (Reddit): From a very practical standpoint, the transportation in this city is such that I can be on my phone all the time and needn’t look up. Whether you’re on a bus, in a taxi, or on the subway, this city frees up your mental energy to focus on other things. Barnhardt (Infor): Infor relocated its headquarters from Atlanta to New York in 2012 because we wanted to think outside the Silicon Valley box. We wanted to hire people from fashion and design. We’ve hired a Pulitzer Prize winner for infographics. And these guys are designing the interface for enterprise software. Being in New York also enables more customers to visit us, particularly C-level executives who either live or visit here, which many more do than in Atlanta. That is incredibly valuable when pitching for business. Kampel (Techonomy): New York has global proximity. Geographically, it offers the best access in the US from anywhere in the world. The time zone also works compared to any global region. New York is a wonderful tech hub, as is Silicon Valley, but other cities are entering the conversation. Look at what Tony Hsieh is doing in Las Vegas, for example. Folks in other cities are learning from what New York has done. You’re starting to see these little tech hubs emerging all over. Rosenberg (Day One): Even a town like Kansas City, KS, with Google Fiber, is attracting tech startups and other brands that want to be involved in the tech community. Google Fiber exemplifies the kind of technology that has changed how people connect in their local communities. Waggener Zorkin (WE): There is so much diversity of ideas and energy in New York. And it’s definitely not in a bubble. In addition, look at all the traditional industries in New York that are truly invested in tech. Even fashion and all the wearable devices. But innovation can truly happen anywhere like minds get together to collaborate and learn. It’s more about that than a particular city’s pedigree. 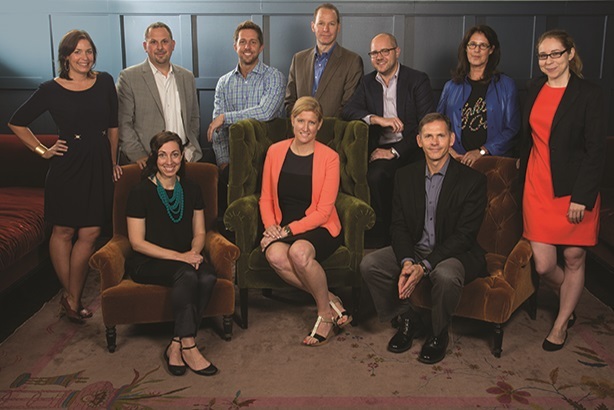 For more from this roundtable, including what comms pros can do to help regulators keep up with the pace of change in technology, click here.